Richard T. Glass, DDS, Ph.D. In 1986 a systematic study was published concerning microorganism found on the toothbrushes of "healthy" dental patients and patients with inflammatory disease, and as controls, toothbrush out of the packages1. As expected, the microorganism that grew from the inflammatory disease patients were those known to produce local (dental) or systemic diseases. Pathogenic microorganism were also found on toothbrushes from "healthy" patients. Of equal concern was that four of five toothbrushes from on manufacturer were contaminated in the package. After the initial study, experiments were performed either the delineate the problems of the toothbrush further or the find some means of decontaminating the toothbrush. When known quantities of herpes simplex virus type 1 (HSV-1) were introduced to sterile toothbrushes, it was found that substantial numbers of the virus could be retrieved after 48 hours from artificially dried toothbrushes (HSV-1 is usually killed by drying)2. If the toothbrush were maintained in a moist environment (similar to that of a bathroom), almost one half of original number of virus could be retrieved after seven days. Vital staining of the microorganism reveals a propensity of the microorganism to adhere to defects in the bristles (both shaft and ends) and the cores of natural bristle brushes. These positions of adherence often were associated with proximate jagged bristle edges. Thus, two of the necessary criteria for transmission of disease were met: (1) presence of the microorganism and (2) a potential portal of entry. The attempts at toothbrush decontamination were less fruitful than those of delineating the problem of the toothbrush. Chemical disinfectants had difficulty in penetrating the aggregates of microorganism and penetrating the toothbrush bristle depth and defects. Microwave disinfecting was hampered by the arcing of the metal cleats used to anchor the toothbrush bristles. Disinfecting could be achieved using the microwave; however, the resultant distorted and convoluted toothbrush was not functional. Ultraviolet light disinfecting is promising in killing microorganisms by needs further investigation. with or oral other lesions? 3. Does tooth and gingival brushing with a toothbrush contaminated with106 microorganism(Bacteroides melaninogenicus, Staphylococcus aureus, or Candida albicans) produce more gingival or other oral lesions than does brushing with a sterile or a reused self-contaminated toothbrush? Do these lesions contain the target microorganisms? Can the target microorganisms be recovered from the venous blood within 30 minutes after initial brushing and the gingiva or gingival lesions 24 hours after initial brushing? 4. Does either frequency of tooth and gingival brushing or immune status of the subject alter the incidence of oral or gingival lesions? Eighteen healthy adults dogs were used in the study after a ten-day quarantine. Baseline gingival and venous blood cultures were made at the beginning of the study. The dogs were equally into three groups to answer questions 1, 2, and 3. Dogs in group 1 had their teeth and gingiva brushed with a new initial sterile on Monday, Wednesday, and Friday for the first month of the study. Dogs in Group 11 had brushed their teeth and gingiva brushed with a initially sterile, but subsequently reused, toothbrush on Monday, Wednesday, and Friday for the first month of the study. The toothbrushes used on dogs in group 11 were stored between brushing in the open air n ear a sick to simulate a bathroom environment. Dogs in group 111 were further subdivide into three equal groups (two dogs per group) for brushing with a target microorganism-contaminated brush. The group 111 toothbrushes were initially sterilized and subsequently immersed for 24 hours containing 106 target microorganisms(B melaninogenicus, S aureus, or C albicans). The brushing regimen for all the dogs group 111 was the same as the dogs in groups 1 and 11. Gingival or other oral lesions were recorded prior the subsequent day's brushing, with the date and six of then lesions observed. Each lesion was also cultured. After initial baseline venous blood cultures, additional venous blood were on dogs from group 111 within 30 minutes of the first day of the brushing of each month. These cultures were for both the target microorganism and for normal oral flora. Additional venous blood cultures were also made at the discretion of then examiner. At the ends of the first phase, six dogs had to be dropped from the study (four for persistent upper respiratory symptoms and two for difficulty in handling). After an 18-day normalization period, 18 dogs entered the second phase of the study. Of the 12 carry-over dogs, those that were in groups 1 were moved to group 11; those in group 11 were moved to group 111; and those in group 111 were moved to group 1. The six new dogs were placed in the appropriate groups so that all groups had six dogs. To evaluate the effects for frequent brushing, all groups in the second phase were brushed on Tuesday, Wednesday, and Thursday. The second phase also lasted 1 month and, other than the days of brushing, following the same protocol that was used in the first phase. After a 12-day normalization period, 18 dogs entered the third phase (all second dogs were used; no new dogs were added). The group of dogs were again recorded so that each dogs served as its own control. Twelve dogs had through all three phases was followed. The brushing protocol of second phase was followed. 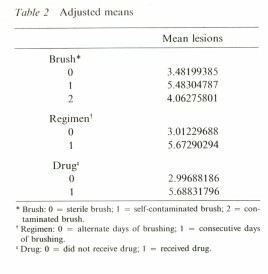 To determine the effects of immunosuppression on ulcer incidence and blood transmission, two dogs from the group 1 (new sterile toothbrush), two dogs from group 11 (self-contaminated toothbrush) and two dogs from group 11(one Candida-brushed and one Staphylococcus were given 2.5 mg/kg of prednisone every other day for seven days prior the initiation of the third phase and every other day for the first 14 days of the third phase. Throughout the entire study, the animals were housed under conditions accredited by the American Association of Accreditation of Laboratory animal care, The dogs were fed a regular diet and water libitum. Some dogs required mild sedation, but, with continued handling, most dogs were easily brushed. The four dogs that developed respiratory disease in the first phase were successfully treated, but were replaced prior the second and third phases. Three litters of healthy puppies were delivered during the time of the experiments. To maintain uniformity in the brushing, the same individuals (wearing appropriate protective clothing) brushed all of the dogs each time. All cultures were processed and evaluated using the current aerobic, anaerobic, and mycotic techniques. All toothbrushes were Oral-B No. 35 (Oral-B Laboratories. Because of the complexity of the protocol, a four-way analysis of variance was performed on the data with dogs, drugs, brushing regimen, and nature of brush as sources of variability. The type 111 sum of squares was used: Each effect was adjusted for all of the other effects. A pair-comparison test was carried out with the data from only those dogs that were brushed with a new sterile toothbrush each time and those brushed with a self-contaminated toothbrushes in the different phases, but who were expose to no drugs. Two hundred nineteen ulcers were recorded in 648 possible recording for overall cumulative incidence of 0.34 ulcers per dog per day. The most common sites of ulcers were the attached gingiva and the vestibule. No difference were noted between acute brushing and chronic as ulcers occurred throughout each phase. Fifty-two ulcers were observed in group 1 animals (sterile toothbrushes); 88 ulcers were observed in group 11 animals (self-contaminated toothbrushes); and 79 ulcers were notes in groups 111 animals (known microorganism-contaminated toothbrushes). In addition, gingival and buccal erythema and buccal mucosal roughness were observed in the group 111 animals. The total average lesion per dog for all phases of the study was 2.0 ulcers per dog in group 1, 4.9 ulcers per dog in group 11, and 4.4 per dog in group 111. If there incidence in Phase 111 alone is considered, the average lesion per dog in was 3.12 ulcers per dog in group 1, 5.0 ulcers per dog in group 11, and 4.7 ulcers per dog in group 111 for dogs that were not immunosuppressed. In dogs that were immunosuppressed, there were 5.2 ulcers per dog in group 1, 10.5 ulcers per dog in group 11, and 6.5 ulcers per dog in group 111. If difference in the brushing patterns are considered, in the first phase of the study (brushing every other day per week), the average of lesions per dog was 1.7 in group 1, 3.3 in group 11, and 2.8 in group 111. In second phase (brushing three consecutive days per week), the average number of lesions per dog was 2.3 in group 1, 4.0 in group 11, and 3.5 in group 111. In third phase (brushing three consecutive days per week, with some dogs immunosuppressed). the average number lesions per dog was 5.2 in group 1, 10.5 in group, and 6.5 group 111. Along with an increased incidence of ulcers, the immunosuppressed dogs from all three groups had an increased tendency toward gingival bleeding. The type of known microorganism appeared to make no difference in the incidence of ulcers: Bacteroides produced the largest number of ulcers in the first phase; Candida produced the largest numbers in the second phase; and Staphylococcus produced the largest number in the their phase. In the third phase (in which both Candida and Staphylococcus were immunosuppressed), the dogs exposed to Candida had the lowest incidence of ulcers and the dogs exposed to Staphylococcus the highest incidence. The type of microorganism present intrinsically in the dog's mouth appeared to effect the results. Dogs that had a range of microorganisms (normal oral flora) appeared to fewer ulcers than dogs that had a predominance of Bacteroides. The group of dogs with the highest incidence of ulcers was the group that had Bactericides and aerobic enteric microorganisms in substantial numbers. Similarly, both Bacteriodes and aerobic enteric microorganisms were often found in the swabs from the individual ulcers. Although the incidence was low (four post brushing positive blood cultures), it appeared that microorganisms can be transmitted from the oral cavity into the blood in sufficient numbers that they can retrieved on cultures. One positive culture was found in both groups 1 and 111, and two positive cultures were found in group 11. There appeared to be no consistent pattern of ulceration as the dogs moved from one group to another. For example, while dog 2392 had the highest incidence of ulcers when brushed with its self-contaminated brush in group 11, second phase, it had the lowest incidence of ulcers in group 1, first phase and group 111, third phase (even thought it was immunosuppressed in the third phase). Similarly, dog 1867 (immunosuppressed, group 111, Staphylococcus contaminated), had on the highest ulcer incidence in third phase but much lower ulcer incidence in first and second phases. Healing appeared to be slow in the immunosuppressed dogs from all three groups. Healing in other groups and phases did not appear to have be predicable pattern. For the most part, all ulcers were healed by the beginning at the next brushing cycle of a particular phase and often by the next day. � Brush type: 0=sterile brush; 1=self-contaminated brush; 2=contaminted brush. � Regimen: 0=alternate days of brushing; 1=consecutive days of brushing. : Drug: 0=did not receive drugs; 1= received drug. The data used for the statistical analysis of variance was taken only from 12 dogs that completed all three phases of the study. Also, due the differences brought on immunosuppressive drugs, individual sample sizes were often small. This may account for the fact that, while the analyses often were near significance, only the brushing regimen change was found to be statistically significant using the analysis of variance tests. 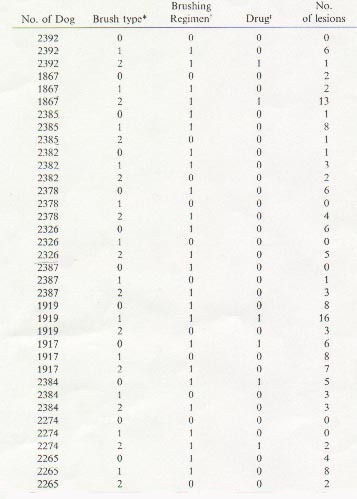 Table 1 summarize the data from the 12 dogs that went through all three phases, and Table 2 provided the estimates of the mean number of lesions by brush, regimen, and drug. The pair-comparison test confirmed that, regardless of other variables such as regimen or immunosuppressive drugs, the most oral ulcers developed in animals in which self-contaminated toothbrushes were reused; the fewer ulcers developed when a new sterile toothbrush was used every time. Both statistical tests showed that increasing brushing significantly increased (P.05) the incidence of oral ulcers. While the clinical observations associated the toothbrush with (at least) dental disease were important, and while laboratory observations demonstrated long retention of viable herpes simplex virus type 1, the results of the present the necessary link to implicate to toothbrush as a potential transmitter of disease. 12. Further, the findings of the study should cause not only the dental professional, but also the medical profession, to consider the influence of the toothbrush on not only the sick patient but also the "healthy" individual. In light of the evidence, from the clinical observation to laboratory observation and now in animal model, it makes sense to recommend that patients with mucosal disease, periodontal disease, and even dental caries changes their toothbrushes at regular, short intervals (such as weekly or biweekly) when they are in active therapy. In the initial study, the recommendation was made that toothbrushes be changed at least once per month and at the beginning and end of every illness 1. The recommendation that the toothbrush be stored outside the moist and contaminated environment of the bathroom is important. In the dog model, the not only oral flora (Bateriodes) but also enteric microorganism (such as those found in moist bathrooms). From a medical point of view, the results of the toothbrush studies have a direct application. Toothbrushes should changed frequency by patients with persistent or recurrent upper airway and gastrointestinal infections, by patients who are undergoing bypass surgery or organ/tissue transplantation (who cannot risk a bacterial/septicemia), and by patients who are immunocompromised by virtue of diseases such as acquired immunodeficiency syndrome or chemotherapy for cancer. The authors have received many anecdotal reports from around the world that affirm these recommendations since the initial published report and subsequent publicity. Similarly, preliminary results from a study in which patient with recurrent herpes labiitis change their toothbrushes at the beginning of the prodrome, at the end of the prodrome, or, is vesicle forms, changing their toothbrushes after the vesicle breaks, indicate a marked decrease in progression from prodrome to vesicle and from vesicle to multiple vesicles. While the present study demonstrated that there was an increase in the ulcers incidence with increased frequency of brushing, this finding should not be misconstrued as a rational for not brushing teeth at all. However, care must be taken with a device (the toothbrush) that may transmit disease so easily. To refrain from brushing would be to reverse completely the progress that has been made in preventive dentistry. The admonition remain: Change toothbrushes frequently. Design a microbial-resistant toothbrush. The results of the study indicated that toothbrushing with even a sterile toothbrush produced gingival or mucosal ulceration. Immunosuppersion increased the incidence. Toothbrushing with a self-contaminated brush had the highest incidence of the any groups tested. Further, the incidence was magnified by immunosuppression. Brushing with known microorganisims inceased the incidence of ulcerations as compared to the use of a sterile toothbrush; however, it was not as harmful as brushing with a self-contaminted brush. The ulcerations did not consistently contain the known or target microorgamism. Although the incidence was low, there was evidence to suggest possible transmission of microorganisms from the ulcer into the blood. Daily brushing increased the incidence of ulcerations. The healing of the ulcerations appeared to be dependent on the brushing process and was slowed by the reintroduction of microorganisms. Immunospression increased by the incidence of ulcerations. Most healing occured within one day with reintroduction of microorganisms.